UPDATE: NYPD officer Brian Moore has died two days after being shot in the head from his injuries. NEW YORK -- A man who officials say boasted of being a street "hellraiser" and who served prison time for attempted murder was arraigned on charges that he shot a New York City police officer in the head. Officer Brian Moore "is fighting for his life," Queens District Attorney Richard Brown told The Associated Press after spending many hours with the comatose 25-year-old officer. Moore remained hospitalized in critical but stable condition after hours of surgery for what court papers described as "severe injuries to his skull and brain." His family members "stand in silence with tears in their eyes, not knowing what the outcome for Brian will be," said Patrick Lynch, president of the Patrolmen's Benevolent Association. "This is a painful day for all New Yorkers. It is a painful day for all members of the NYPD," Mayor Bill de Blasio said Saturday. The suspect, Demetrius Blackwell, was ordered held without bail Sunday after appearing in Queens Criminal Court in a torn white jumpsuit. His hands were cuffed behind his back and legs shackled. He was arrested Saturday night and charged with attempted murder in Moore's shooting. Demetrius Blackwell, 35, was ordered to be held without bail. He is charged with two counts of attempted murder, assault and weapons offenses, CBS New York reported. The 35-year-old suspect did not enter a plea during the five-minute arraignment, for which more than 100 officers packed the courtroom. Prosecutors said they intend to present the case to a grand jury before Blackwell's next court date, which was scheduled for Friday. "This was nothing more and nothing less than a cold-blooded attempt at an assassination of New York's finest," Assistant District Attorney Peter McCormack said. Blackwell's court-appointed lawyer, David Bart, said his client "emphatically denies" the charges, which also include assault and weapons offenses. McCormack said Moore and patrol partner Erik Jansen - both in plainclothes in an unmarked police car - approached Blackwell on a Queens street after seeing him tugging at his waistband around 6:15 p.m. Saturday and asked him "What are you carrying?" The officers ordered Blackwell to stop and exchanged words with him. That's when Blackwell turned, the prosecutor said, and "in a vicious manner started to fire" - at least two shots. Jansen was not hit and radioed for help. Officers searched house by house in the quiet Queens Village neighborhood, and some could be seen walking on roofs as helicopters flew overhead. After Blackwell's arrest, McCormack said, three witnesses picked him out of a police lineup. He said Blackwell told a detective that he is known as a "hellraiser on the street." After the arraignment, Bart told Judge Michael Yavinsky that his client was arrested at his home without a warrant and that "the arrest may be illegal." Both McCormack and a police spokesman declined to comment on the warrant, citing the ongoing investigation. According to state corrections records, Blackwell was convicted in 2001 on an attempted murder charge. Brown told the AP that Blackwell pointed a handgun at the occupant of a car in a robbery attempt, then fired shots at the vehicle. Other details on the case were not immediately available. Blackwell served the full five years of his sentence, and then returned to prison for violating parole in 2007. He was released again in 2008. 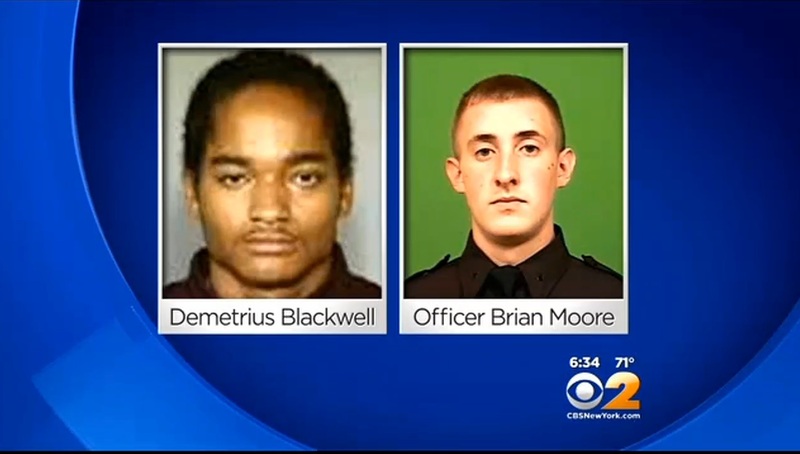 McCormack said Blackwell also was arrested in 2013 after he grabbed at an NYPD detective's badge and spit at him. Bart said his client "has no particular animus toward police officers." Moore, who comes from a family of cops, has been on the job since July 2010. His listed address is a small, well-kept house in the Long Island hamlet of Massapequa - a tight-knit community where neighbors have known each other well for decades. Many families have relatives who are police officers. Neighbors had only kind words for Moore, some saying they shed tears after hearing he was shot. The shooting was the fifth of an on-duty police officer in as many months. The attack evoked fears of the December slayings of two uniformed officers, Wenjian Liu and Rafael Ramos, as they sat in their patrol cars in Brooklyn. The shooter had posted online that he was seeking retribution against officers for the death of Eric Garner in an apparent chokehold by police. But Police Commissioner William Bratton said Blackwell had made no such anti-police postings and was being pursued by the officers because of his behavior. In January, two plainclothes officers in an anti-crime unit survived being struck by two gunshots each in the Bronx.